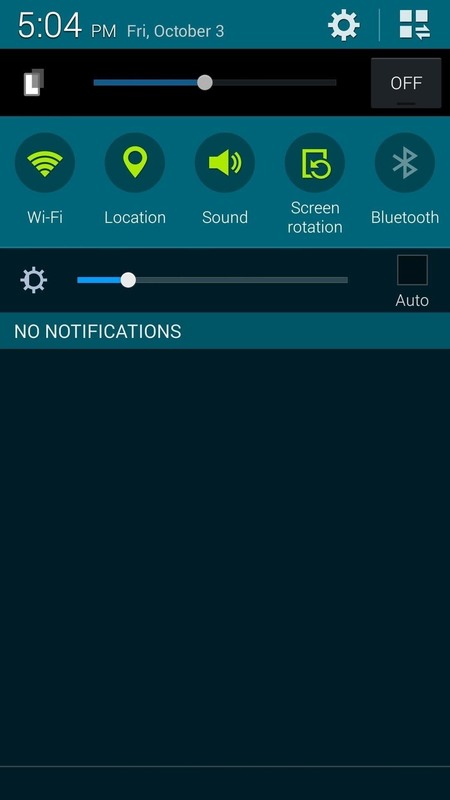 At night, no matter how dim my Android's screen gets, it never seems to be enough—especially when I'm in bed. In fact, in pure darkness, the lowest brightness setting on my Android devices end up giving me a headache that keeps me up for hours. 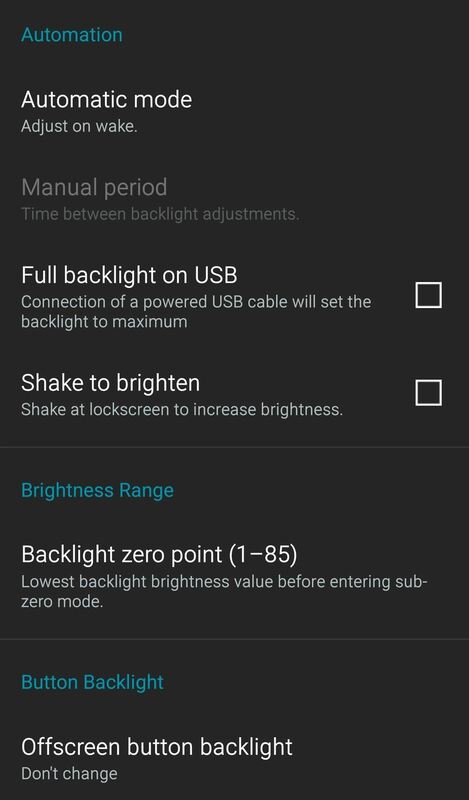 But there are ways to make an Android's display dimmer than the default minimum brightness, whether it's for easing the strain on your eyes (or significant other's eyes) at night, or for using in a dark movie theater (not that I condone that). On that note, here are my three favorites apps that get the job done, no matter if you're rooted or not. With over a million downloads, Screen Filter from developer Brett Slatkir is kind of a classic now, and for good reason. The app doesn't include any more features or preferences than it needs, which means it's fairly simple to use. 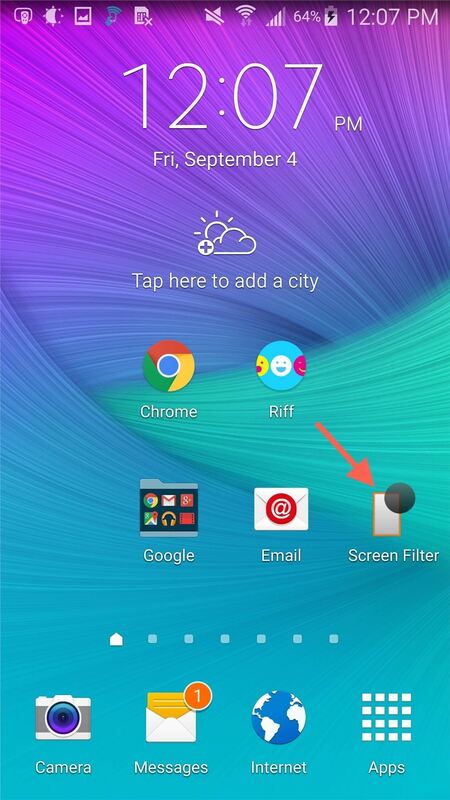 Once installed, a home screen icon will work like a toggle, automatically dimming your display when tapped. 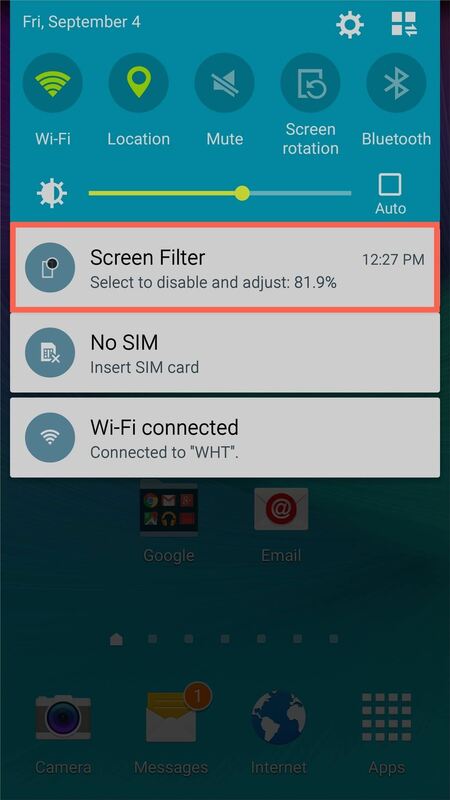 To access the settings, pull down your notification shade and tap the Screen Filter notification. 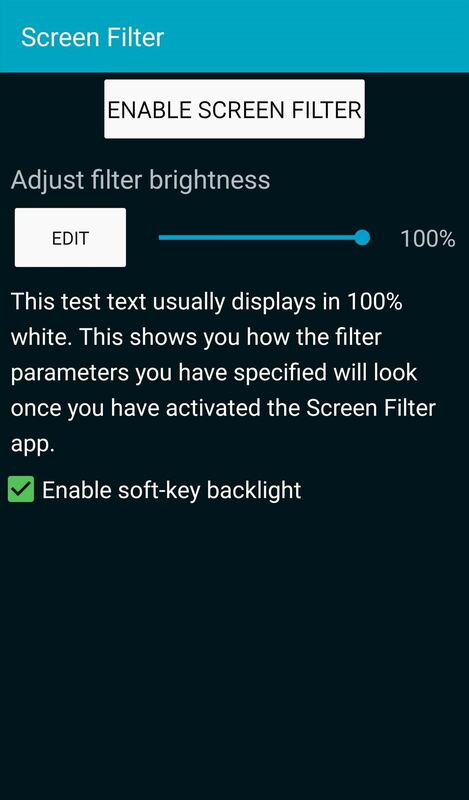 Within the app's settings, you can select the brightness level that's applied when you tap the icon. As a precaution, when you select a low brightness level, you'll be prompted to confirm the brightness. If not, the app will automatically disable it, which comes in handy if you accidentally make your entire display black. Lux Lite, from developer Vito Cassisi, isn't as basic as Screen Filter, and that's why I like it. 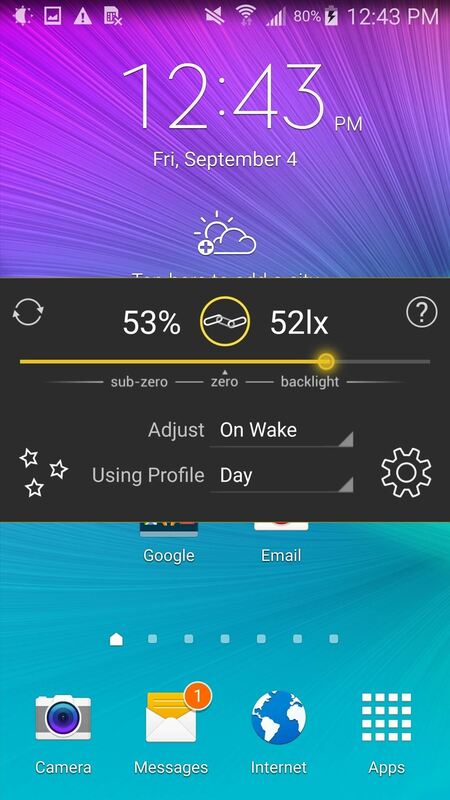 In addition to the various settings it offers, the app provides several profiles that allow you to set up different brightnesses, then switch between profiles depending on the environment you're in. 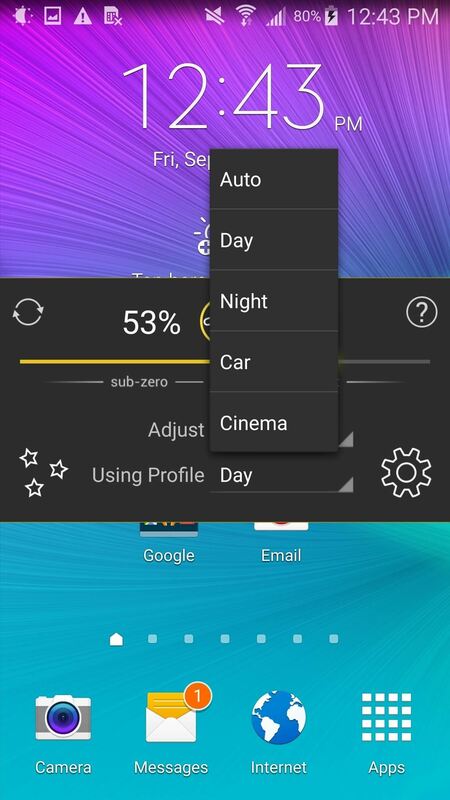 To easily configure the app, tap the icon and select a brightness. You can specify a profile and how the brightness level adjusts to it. The preset profiles are definitely a nice touch by the developer. 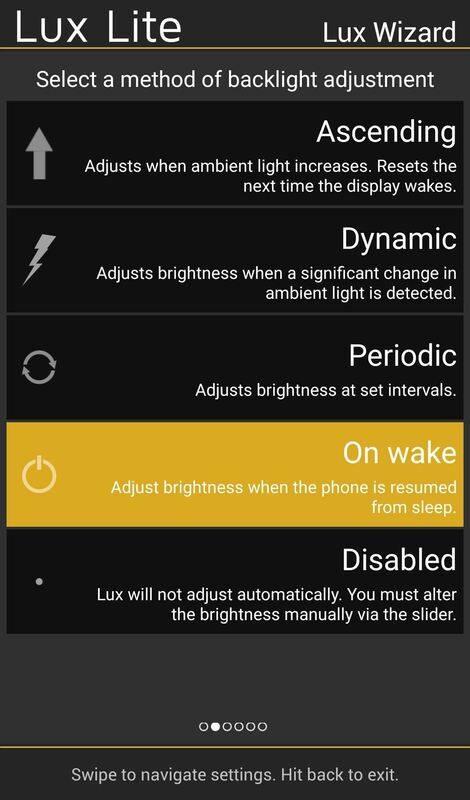 Using the gear icon, you can access a plethora of settings that Lux has to offer. Fine tune the app to function the way you want with all the additional preferences, like Dynamic backlight adjustment or "Shake to brighten." While these apps are useful when laying in bed late at night, they don't necessarily make it easier for you to fall asleep. If you're attempting to combat insomnia, you'll need to either take a look at the Twilight app or the root option CF.Lumen. These apps gradually filter out the blue light emanating from your device that creates eyestrain, filtering it with a different color that's easy on the eyes and makes falling asleep easier. I would like to caution any users who use LuxLite. I've not had so many problems with one app interfering with others than I had with this one. I finally uninstalled it. I'm not blaming the coder, it's just however he goes about doing things, seems to interfere with other apps. The final straw was it interfering with me being able to tap "Grant" when the SuperUser query popup appeared asking for root permissions. If you use this, and weird stuff happens, try disabling this app first before complaining about the other new app you just installed. Great info, thanks. What Android device do you have? No, I do not use my cell phone while at the movies, I think it is rude and shows no self control. I am NOT a slave to my phone!